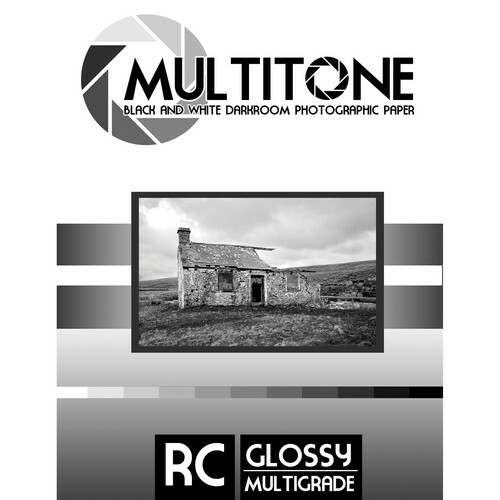 MultiTone Black & White RC Paper (Glossy, 11 x 14", 50 Sheets) is a durable resin coated photo paper. With a glossy finish it causes highlights to sing off the print, while giving shadows a slick, dark look after dry down. Suitable for both manual and machine processes, the paper is recommended for manual processing. Four contrast grades (1-4) provide flexibility in tonal quality, while its quick drying nature ensures an efficient workflow. Additional features include low fog, high maximum density, and 2 years of storage, in ideal conditions. Box Dimensions (LxWxH) 14.9 x 11.6 x 1.0"